The Minolta MC 1.2/58 is probably Minolta’s most famous lens and a personal favorite of mine. In this in-depth review I have a close look at the Minolta’s qualities and also at its weaknesses. 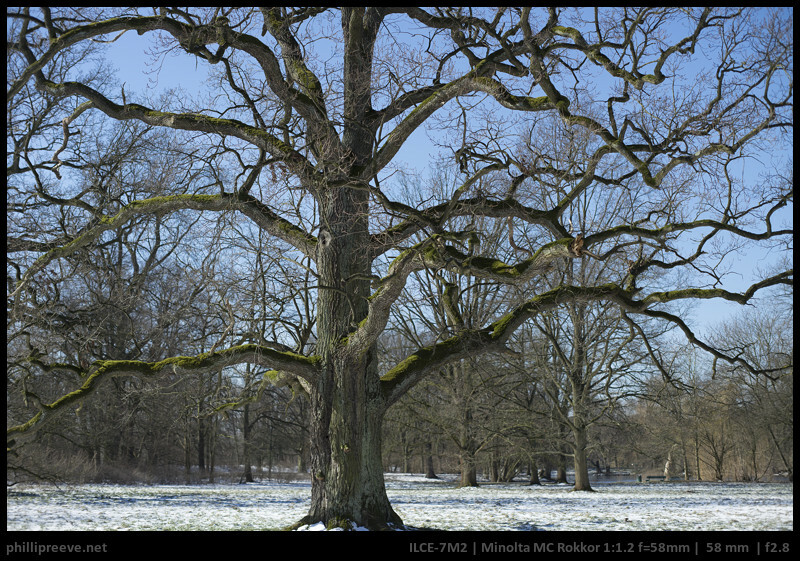 You can find most images shown in the review in full resolution in this Minolta MC 1.2/58 flickr album. TheMinolta MC 1.2/58 sells for $350-450 at ebay.com or 330-400€ at ebay.de (affiliate links). 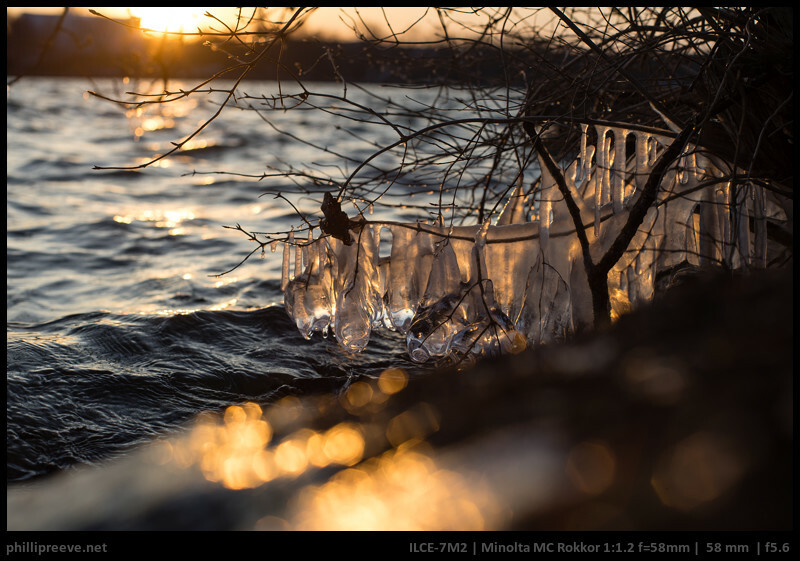 The Minolta’s most sought after feature is its speed: many photographers pay a very significant premium for the super fast aperture of f/1.2. In my experience this aperture is actually of limited practical use and I would argue that its biggest feature is the very nice bokeh at f/2. More on that in the review. The Minolta MC 1.2/58 is a fully manual lens. 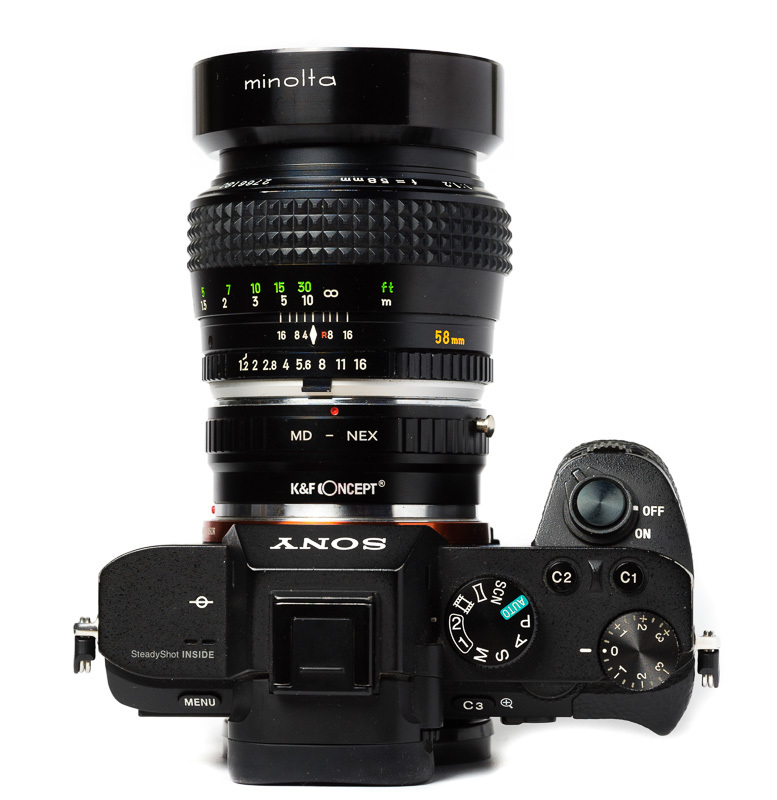 Because of the mechanical construction of the lens it is, in contrast to almost every other Minolta SR-mount lens, quite easy to adapt it to either Canon EF or Sony A-mount. Adapters are made by Leitax and Jim Buchanan. I used the lens on a Canon 5dII for some time with a Leitax Adapter which is really solid, without modification it can’t be focused further than 5m without hitting the mirror though. 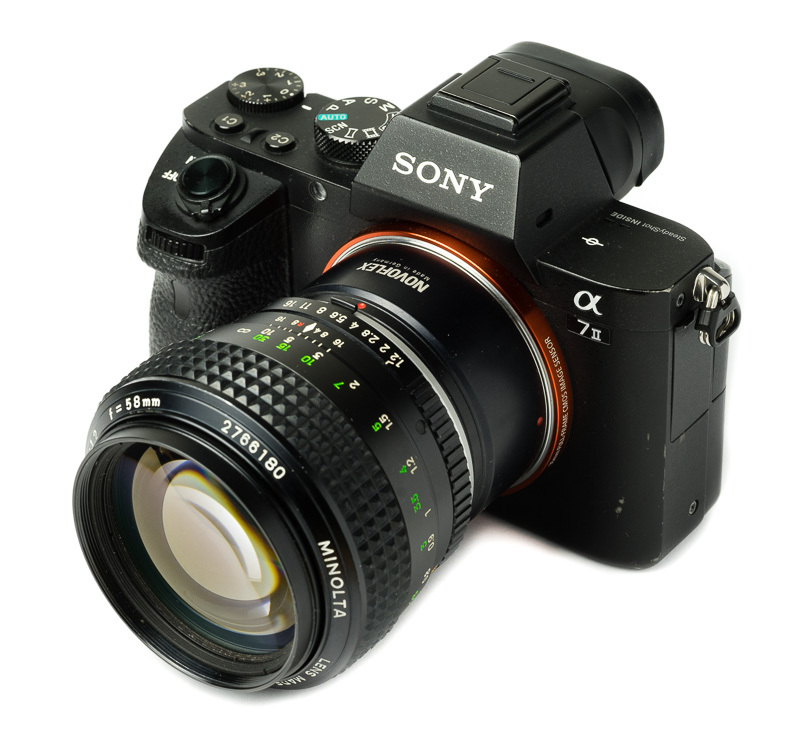 It is even easier to use this lens with a Sony a7 series camera or any other mirrorless system because these cameras have a flange focal distance than traditional DSLRs and this lens can be directly adapted with a adapter. Also check out my Minolta SR-mount adapter guide. There are 3 mechanically different versions of the lens which share the same optical design. 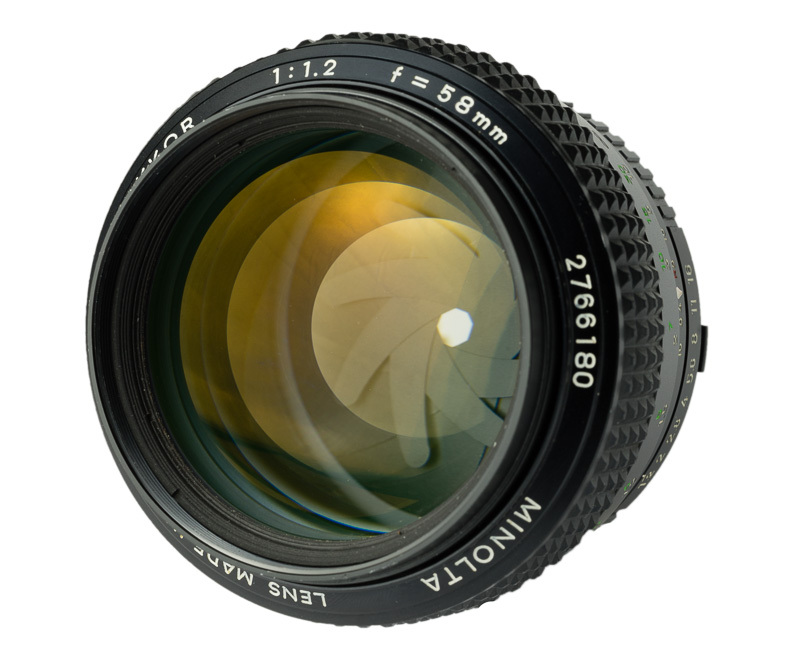 The first version was built from 1966-1969 and the focusing ring is made completely from metal and flat. It is the rarest of the three versions and its lenses develops a yellow cast over time which might be due to a radioactive element. You can see an image of it here. The second version was built from 1969-1973 and the focusing ring is also completely from metal but it has some elevations which the first one didn’t have. The third version is most common and was built from 1973. The lens has a rubberized waffle style focusing ring and while all the earlier versions were labeled Rokkor-PG (indicating a 5 Groups, 7 lenses design) the PG-affix was dropped during the production of this version. The images shown in this post depict the third version. All versions seem to perform the same, of course there is sample variation and someone might find that his older copy performs better than a younger one but I don’t know of any evidence indicating a systematic difference between them. 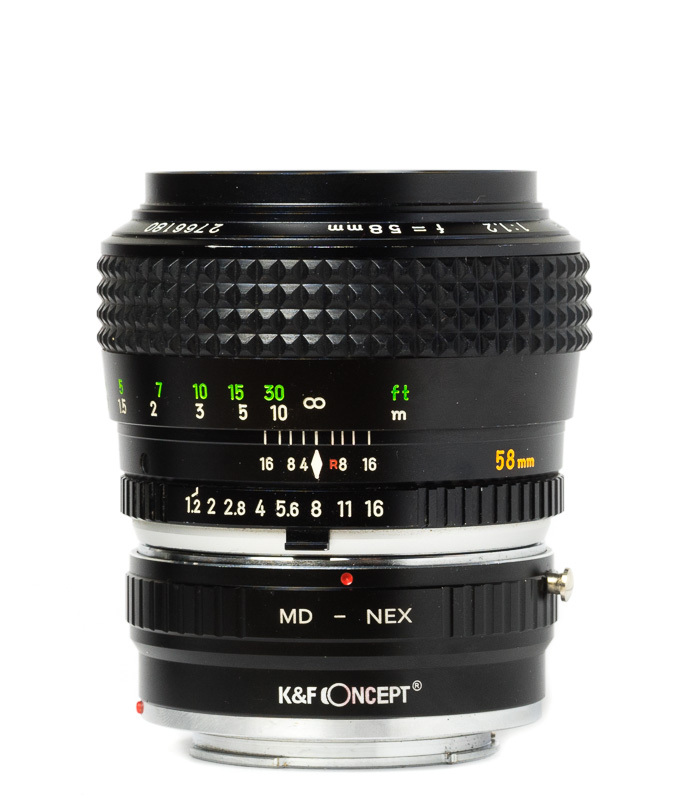 The lens is completely made of high quality metals with a rubberized focus ring. It feels very solid. It is really resistant to mechanical wear, even though I have used this 45-years-old lens quite a lot there are close to no scratches. The focus ring turns nice an smoothly. The focus ring travels about 80° from 60cm to 1m and a further 95° to infinity which is just about right for any application. It doesn’t get better than this. The aperture ring can be adjusted in half-stops, only from f/1.2 to f/2 the is no stop between. The ring feels very solid and the clicks are distinctive. The original hood is quite rare and pretty expensive. Since I don’t own it I can’t tell you much about it. I use a very solid metal hood from the MC 1.4/50 instead which is a little shorter but protects the front element well. 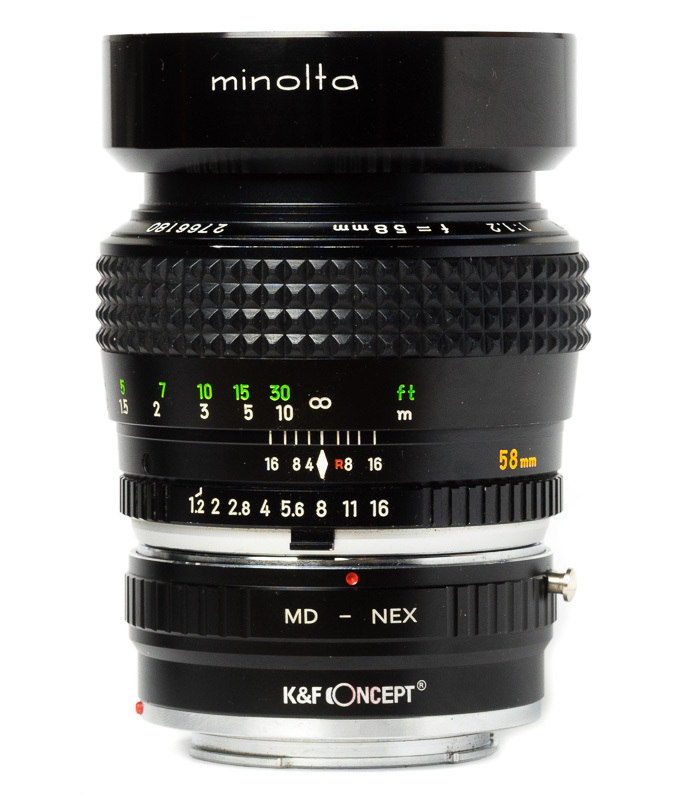 At 478g the Minolta MC 1.2/58 is a substantial lens and significantly heavier than other f/1.4 standard lenses which are usually below 300g. So it is a little annoying to carry it but handling is about perfect on my a7II where it is very well balanced. 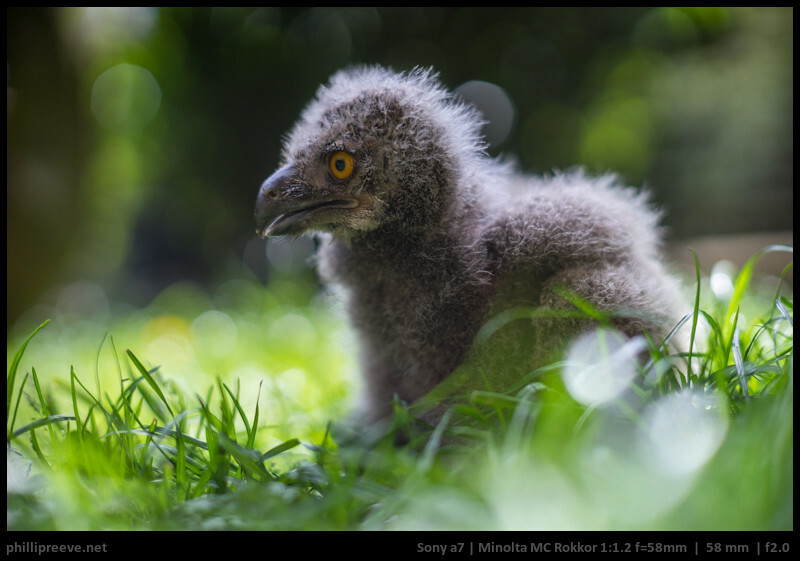 These results are based on the use with a Sony a7 and a7II. 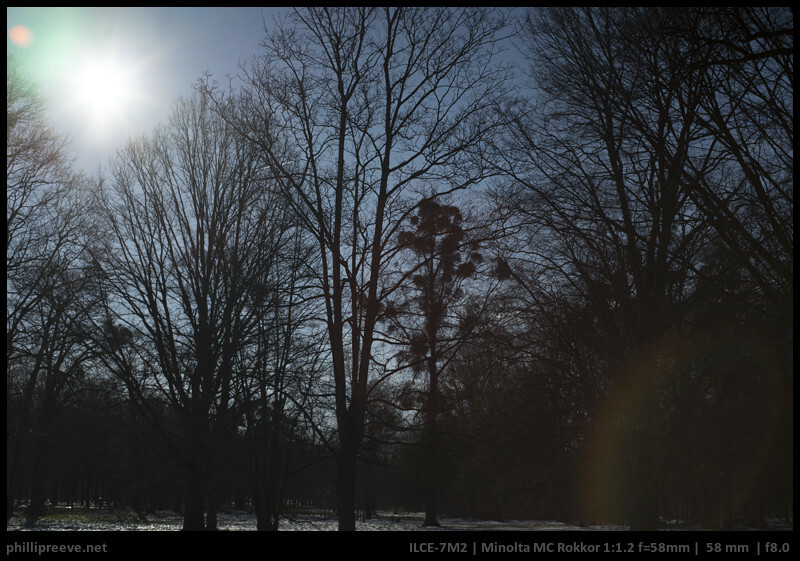 Minolta lenses are known to be rather flare prone and the 1.2/58 has a pretty big front element so it is hardly surprising that it often shows ghosting and veiling flare. If good flare resistance is important to you, this lens is not for you. At times I like to embrace this technical weakness and play with it. The Minolta is the only SR-mount lens with 8 aperture blades which results in somewhat decent sunstars stopped down to f/11 or f/16 but you have to consider the bad flare resistance so this isn’t worth that much. 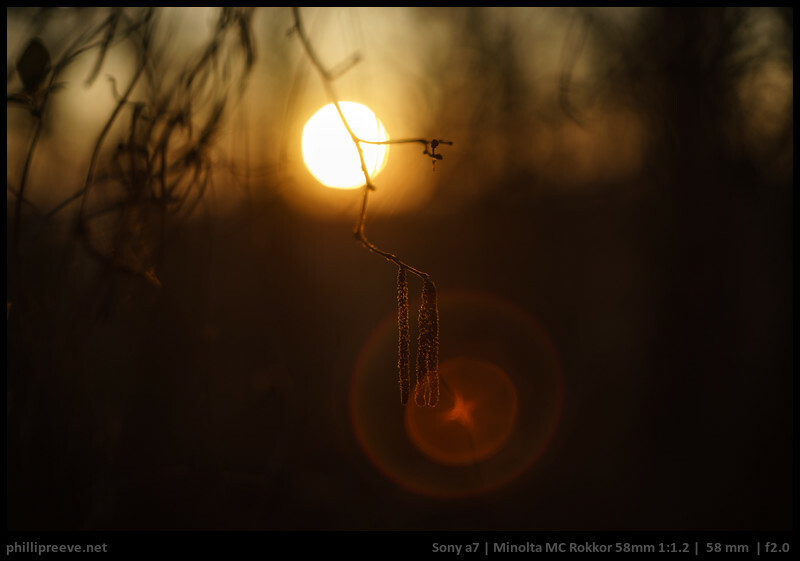 The Minolta MC 1.2/58 has a reputation for its bokeh so let’s have a in-depth look at it. At f/1.2 bokeh is somewhat busy. There is quite a bit of outlining in bright oof highlights behind the focus plane as well as quite a lot of green fringing. At f/2 bokeh is smooth with hardly any outlining and much less fringing. f/2.8 is even smoother but of course with significantly less blur. The aperture shape doesn’t really deteriorate. The transition zone is rather smooth at all apertures. Here the busy bokeh wide open is less distracting and color fringing not an issue because of the warmer colors. Scene 3: Medium Distance, backlit. This is a torture test which would be a hard test for any lens. Even at f/2 which gave very good results in the tests before the Minolta struggles. As before the center shows somewhat busy bokeh wide open which improves a lot at f/2 so no real issues here. The issues are visible at the edges which are pretty busy. 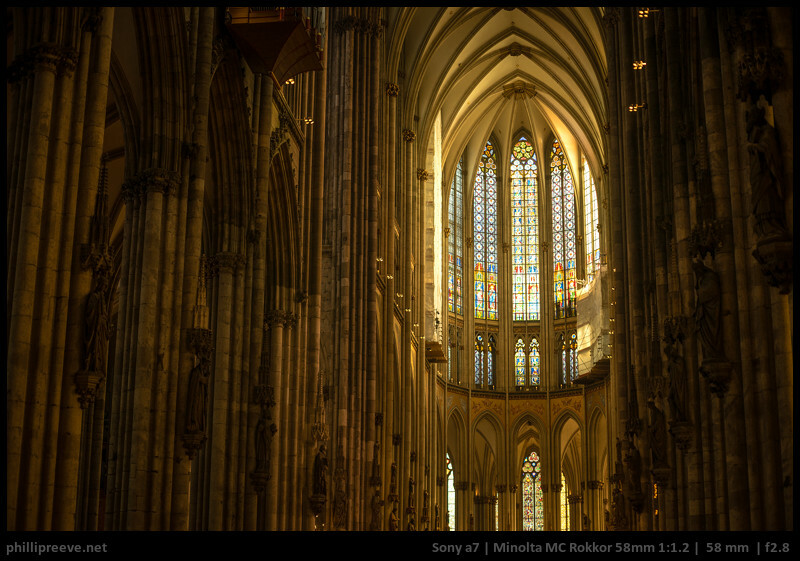 Stopping down to f/2.8 reduces the issue but it does not eliminate it. We also see quite a lot of color fringing behind the focus plane at f/1.2 and f/2. Only by f/2.8 fringing is controlled well enough. We see pronounced cat-eyes wide open and less defined octagons stopped down. 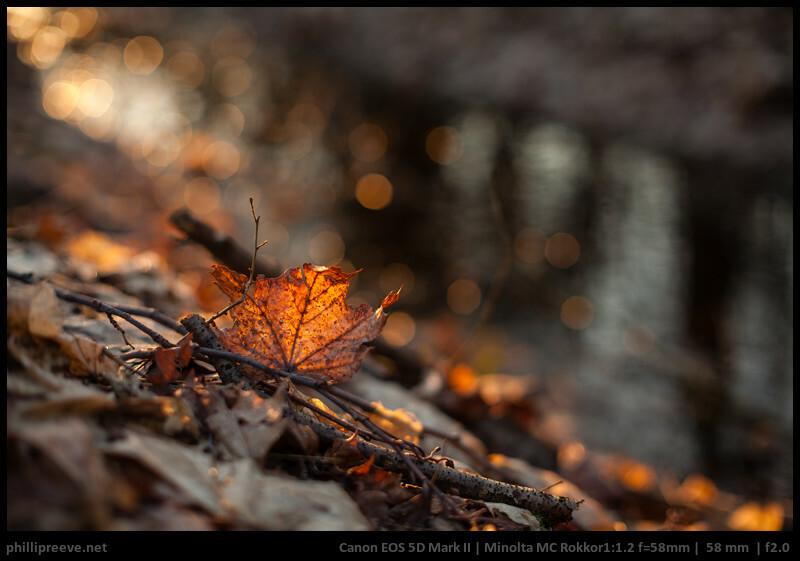 Conclusion Bokeh: So what to make of these results? 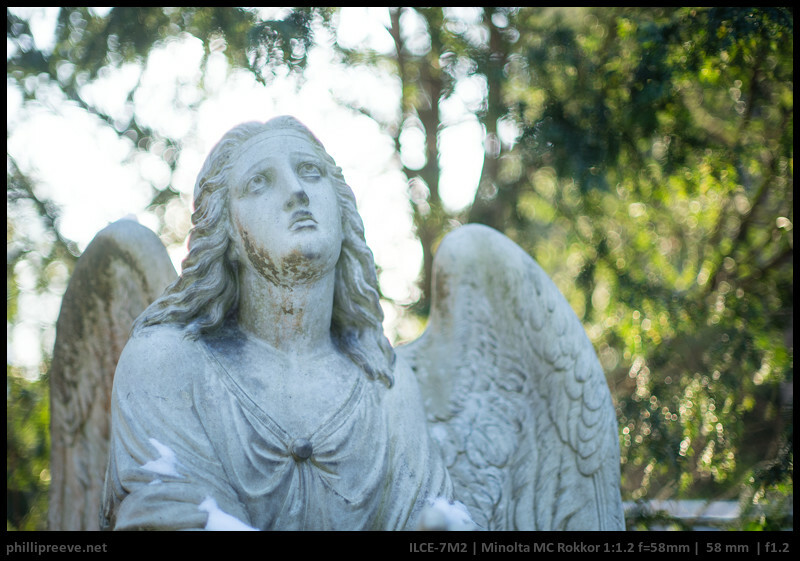 Compared to any other legacy normal lens I have ever tested the Minolta has the smoothest bokeh. So the hype is justified to a degree. A few of the finest modern lenses have smother bokeh with less CA though even if that comes at the cost of onion rings which the Minolta doesn’t have. F/1.2 can work well for some scenarios but it should really only be used with consideration since results easily turn rather funky when scenes have a higher contrast. Maybe 80% of the time I use the Minolta MC 1.2/58 at f/2 because at this aperture it combines decent sharpness with very nice bokeh and good blur potential. I see no reason to buy the Minolta if your focus is on using it stopped down since other smaller and more affordable lenses give excellent results as well but if you have it with you you can be sure to get excellent results unless you have detail in the extreme corners at f/2.8 or shoot into the sun. 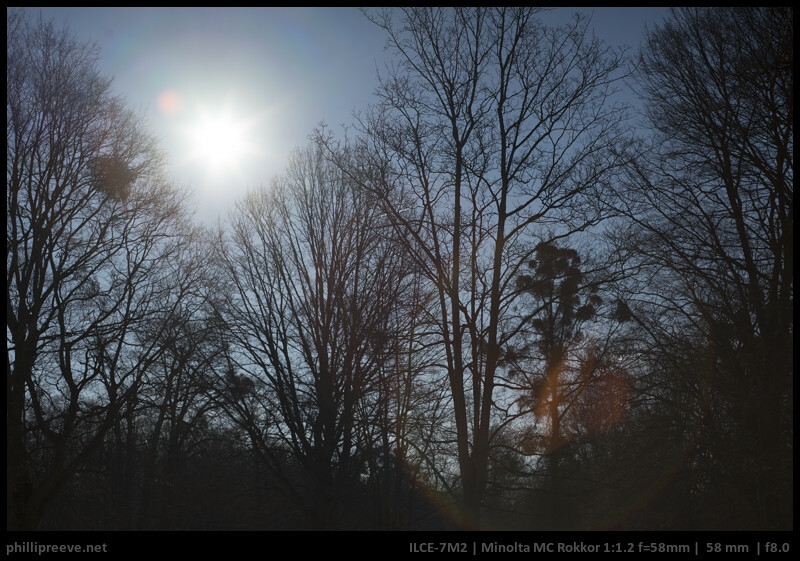 The Minolta 1.2/58 has very low contrast wide open which improves to decent levels at f/2 and good levels by f/2.8. 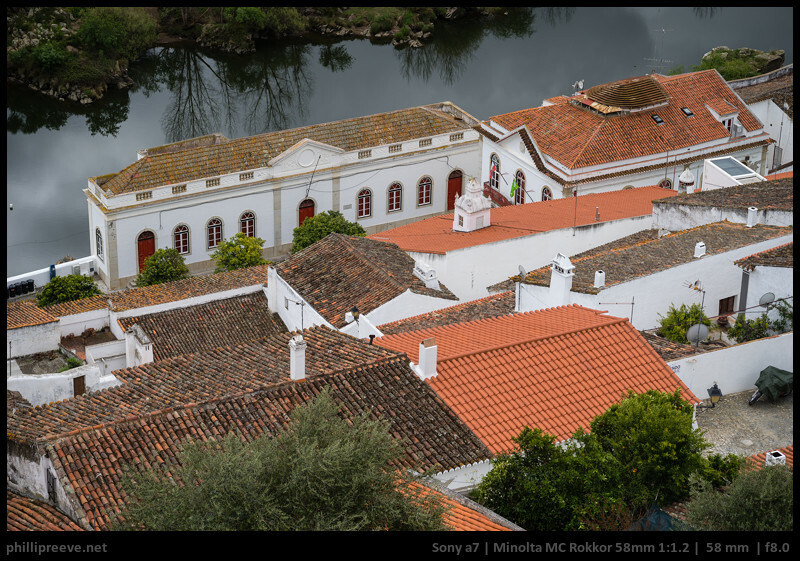 Sample images developed with default settings in LR. Because of the season I couldn’t find any water fountains but even so I can tell you that axial CA are an issue for some scenes at f/1.2 and f/2. CA isn’t gone completely but much reduced by f/2.8. Lateral CA on the other hand are corrected really well and close to invisible in my testing. f/1.2: is very strong at 2.5 stops. f/5.6: No issue at all at 0.3 stops. From my testing I also have to report that transmission in the center is improved by just one, not the expected 1.5 stops in the center. 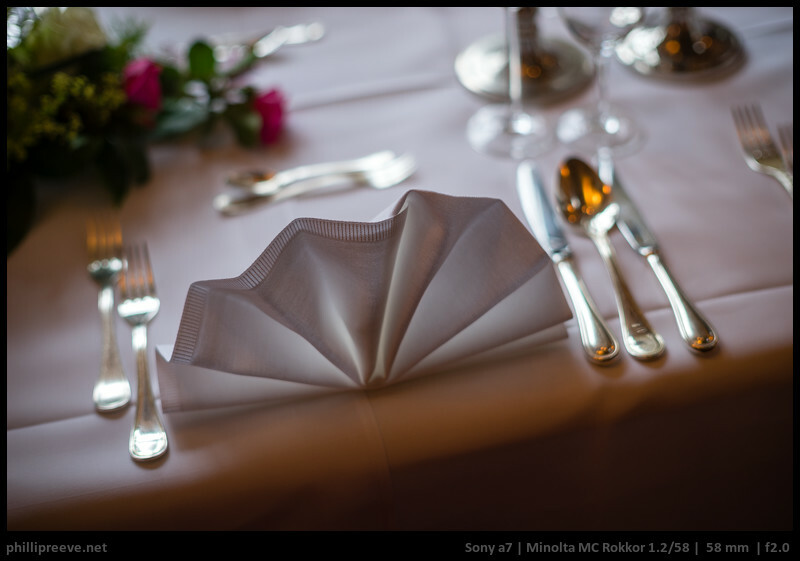 The Minolta 1.2/58 shows minor barrel distortion which should be hardly noticeable but it can be corrected almost perfectly with a setting of +4 in LR. 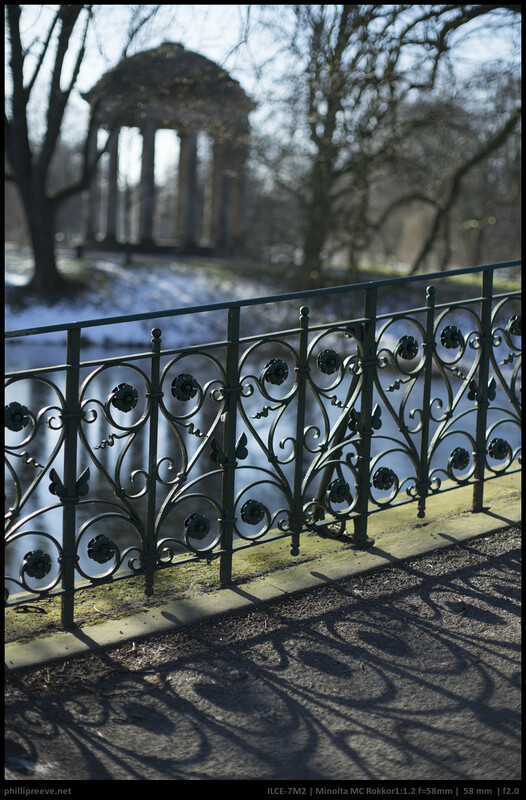 f/1.2: We see lots of spherical aberration which reduces contrast a lot so the sharpness impression is low. Resolution is actually quite good across most of the frame. Only the last quarter shows bad resolution. f/2: Now most but not all of the SA is gone and the sharpness impression has improved a lot. Most of the frame is sharp to very sharp, only the last quarter of the image circle shows low sharpness. 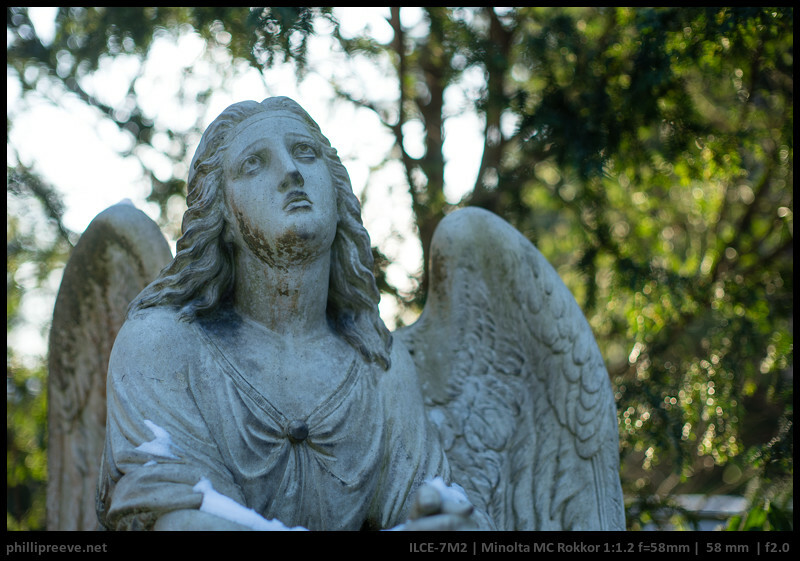 f/2.8: By now all SA is gone and the Minolta 1.2/58 shows excellent sharpness across most of the frame. Compared to f/2 the improvements are most obvious off center. The sharp area increases quite a bit but the corners remain soft. f/4: A minor improvement in the center and midframe area but the very sharp area extends further and stops just before the extreme corners. f/5.6: A small improvement in the corners which are very good by now. f/8: A slight decrease of center sharpness but a slight increase of corners sharpness. f/11: The whole image is a little softer. 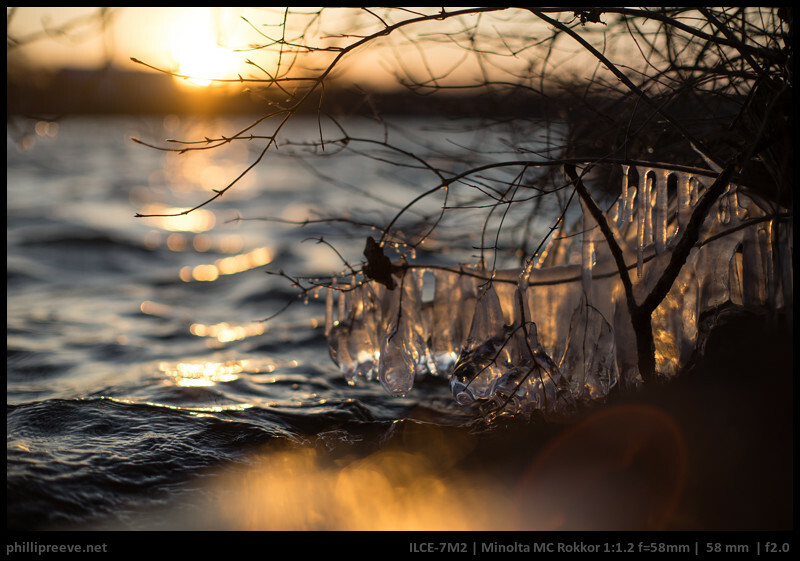 Minolta MC 1.7/55: The lens which comes closest to the 1.2/58’s qualities while remaining very affordable. Bokeh isn’t quite as nice but close. 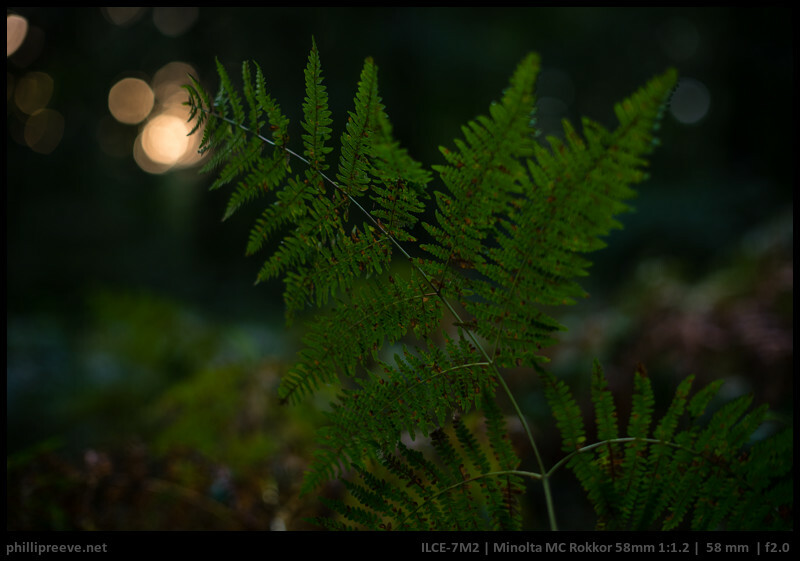 The much smaller and lighter 1.7/55 is a little less sharp and doesn’t resolve as well at f/1.7 as the 1.2/58 at f/1.2 but it is usually sharp enough. Another advantage of the many times as expensive Minolta 1.2/58 is that it has 8, not just 6 aperture blades which matters stopped down to f/2.8 or more. Mitakon 0.95/50: Significantly heavier and more expensive but if you want a super fast normal lens with good performance from wide open the Mitakon is the better lens. 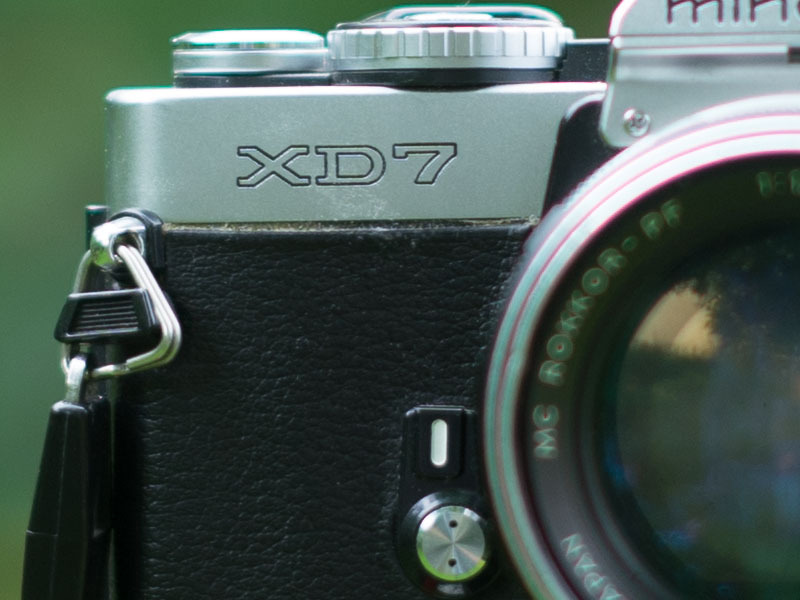 Voigtlander 2/65 APO: This is technically one of the very best lenses you can buy today. It is exceptionally well corrected for any aberrations and excellent across the frame from wide open. It is a little bigger and a little more than twice as expensive as the Minolta. 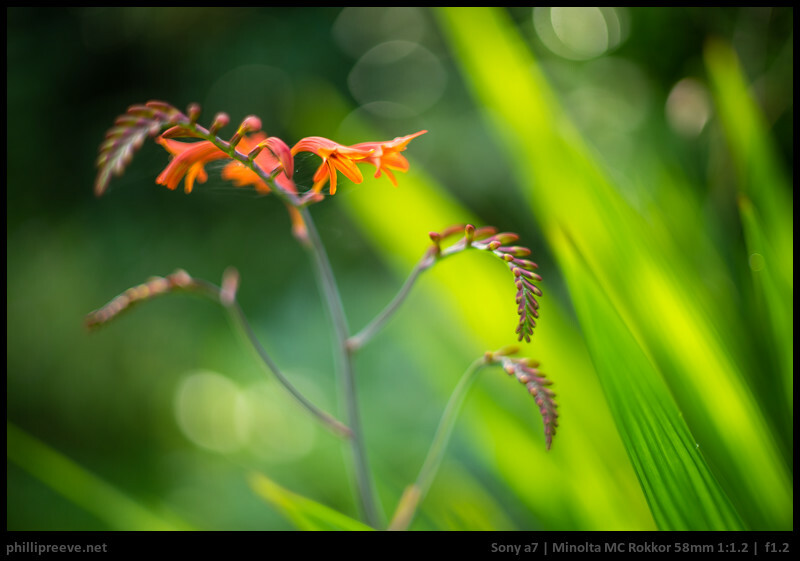 The Sony FE 1.8/55 costs two to three times as much and it is sharp to the corners from f/1.8 with very smooth bokeh. Bokeh is also exceptionally smooth but occasionally spiced with some onion rings. Built quality is not as good as that of 1.2/58 and the manual focusing experience is certainly inferior. The Canon nFD 1.4/50 is a little sharper and much lighter and affordable but I don’t like the bokeh as much and built quality is inferior as well. If you look at the table above you see a longer list of cons than pros. This design is 50 years old and it shows. 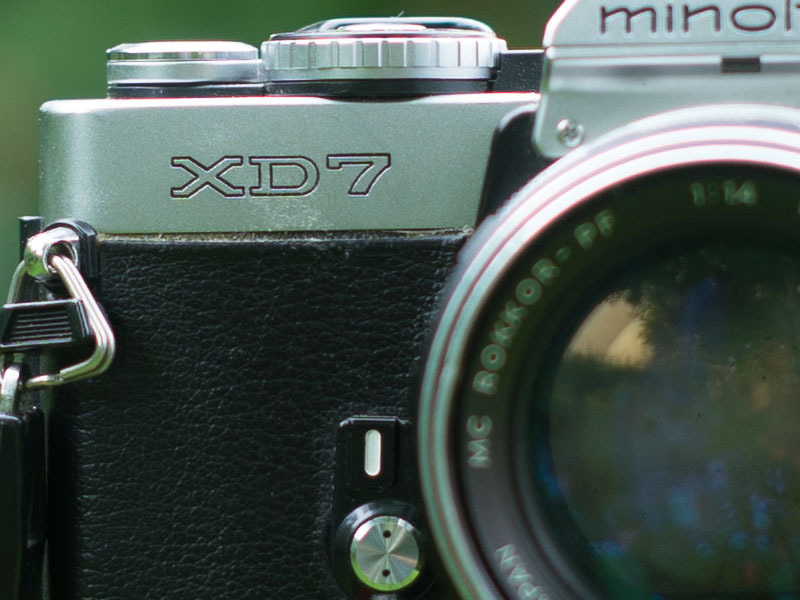 And yet remaking this review gave me a reason to use the Minolta 1.2/58 again and I enjoyed the experience quite a lot so I think that I will use it more often in the future. I can’t quite rationalize why I enjoy this lens so much when I own modern technically much better lenses like the CV 2/65 APO but I do. 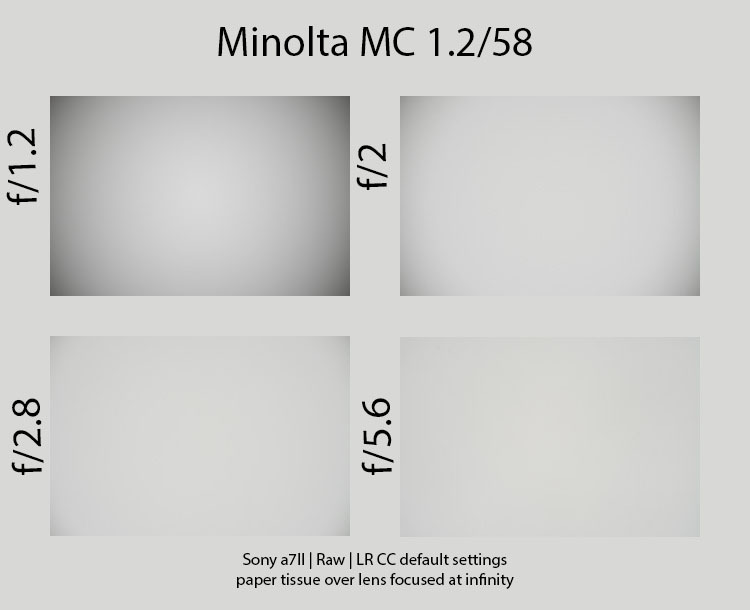 If you aren’t on a tight budget and want to experiment with legacy lenses then the Minolta MC 1.2/58 would be one of my first recommendations. You will be hard pressed to find a lens with better build quality and I don’t know a legacy normal lens with more pleasant rendering . In practice f/1.2 isn’t of that much use unless you enjoy funky bokeh and very low contrast. You gain quite a bit less exposure than the theoretical half stop over an f/1.4 lens and you have to live with very strong vignetting of 2.5 stops. Wide open the Minolta can give decent results in rather dark scenes where you can count on having good resolution across most of the frame. At f/2 the Minolta shines brightest for me: In most scenarios you can enjoy very smooth bokeh combined with good sharpness. It doesn’t have quite the same micro-contrast as the best modern lenses and CA can be an issue but for most scenes I like the results a lot. 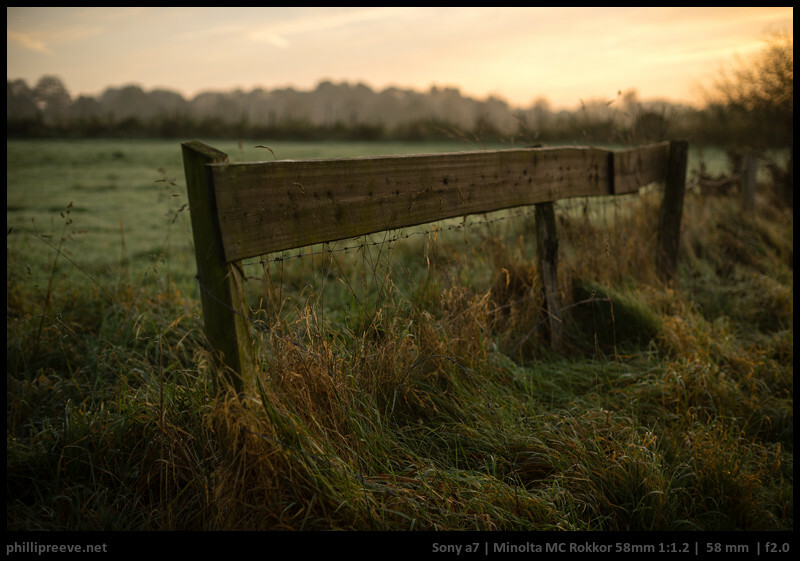 Stopped down to f/2.8 the Minolta makes very good use of a 24 MP FF sensor. About 80% of the frame shows excellent sharpness, competitive with good modern lenses. For very good corners you need to stop it down to f/5.6 or f/8 but then you won’t see a difference between it and more expensive modern lenses apart from the weak flare resistance. 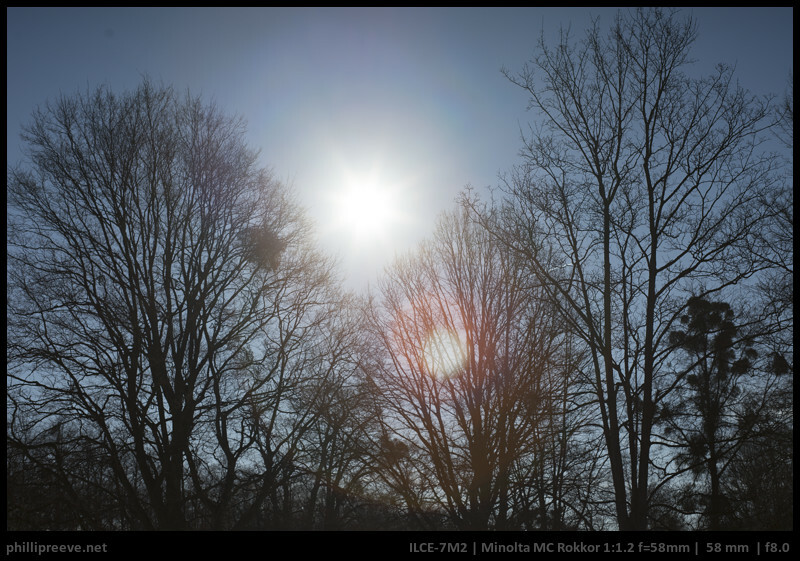 The Minolta MC Rokkor 1:1.2 58mm isn’t the most reasonable purchase: It starts to shine only from f/2 and for a 2/58 it is bloody expensive and heavy. Despite this and a few other deficits the Minolta is one of my all time favorite lenses. After all the testing I did for this review I can’t really explain why. This is a bit frustrating but maybe my images do a better job of explaining my sentiment. The Minolta MC 1.2/58 sells for $350-450 at ebay.com or 330-400€ at ebay.de (affiliate links). Also check out my Minolta SR-mount adapter guide. 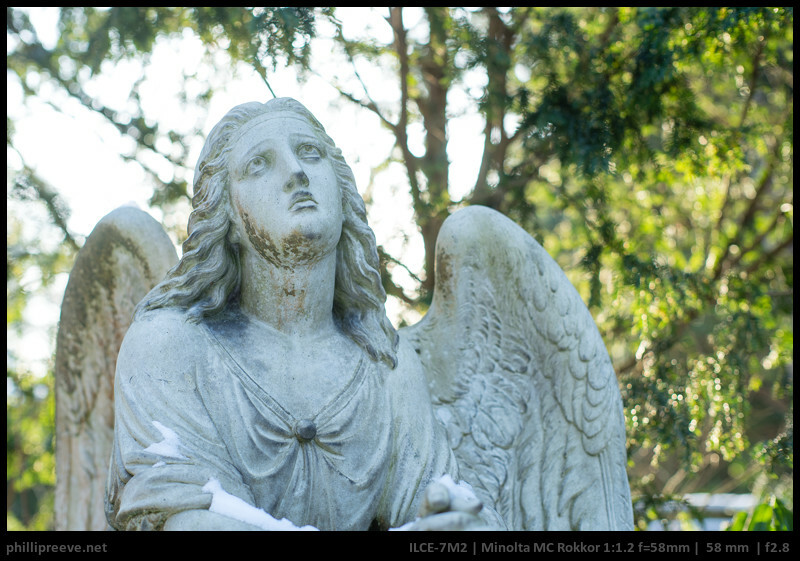 You can find these more images in full resolution in this flickr set: Minolta MC 1.2/58. I like to be outside with my camera and I am also a gear head with a love for manual lenses. 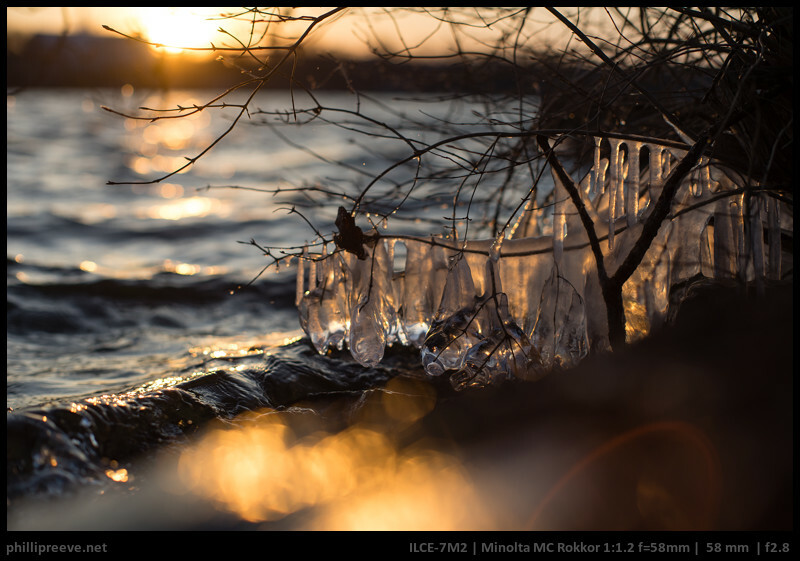 Previous PostReview: Leica Apo-Telyt-M 135mm 3.4Next PostWhat would we take into the mountains? Seems there were 4 versions of this gem. I’ve a Rokkor PG with the rubborized waffle style focusing ring, and by reading the link you mention for the 2nd version, there is a range of serial numbers not referenced starting with 260xxxx (mine is part of the range). Though it was worth to mention it to you. to be honest I mostly use Canon FD glass now, the 1.2/58 and the 35-70/3.5 are the only ones which I use quite regular. Great read and has made me buy one of these beautiful lens! I’m looking forward to trying it on the A7R. Are there any other Rokkor lenses that you would recommend for your A7? 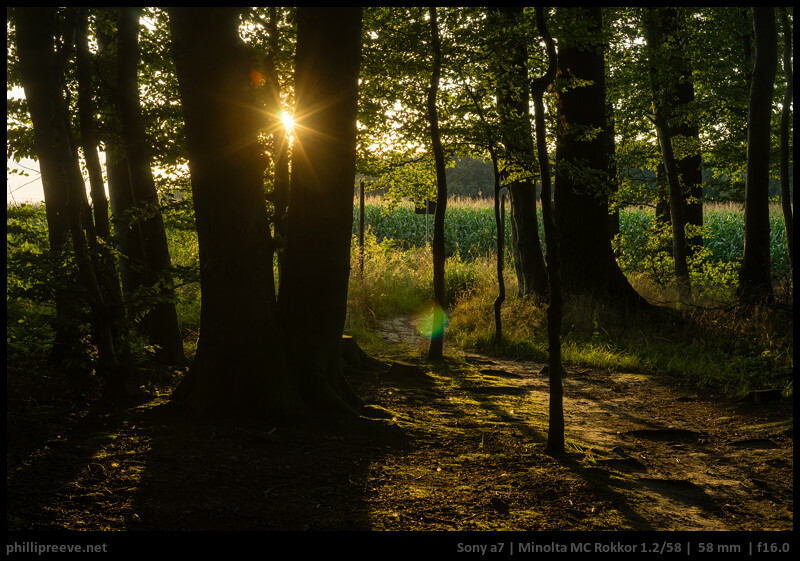 I have a Minolta 58 f1.4-one of the best ever-a MC 200 f4-nothing sharper, MC, MD rokkor 24-again nothing sharper-a 55 f1.7 and a 50 f1.7-again super sharp-the 200 and thd 24 were in conjunction with Leica. 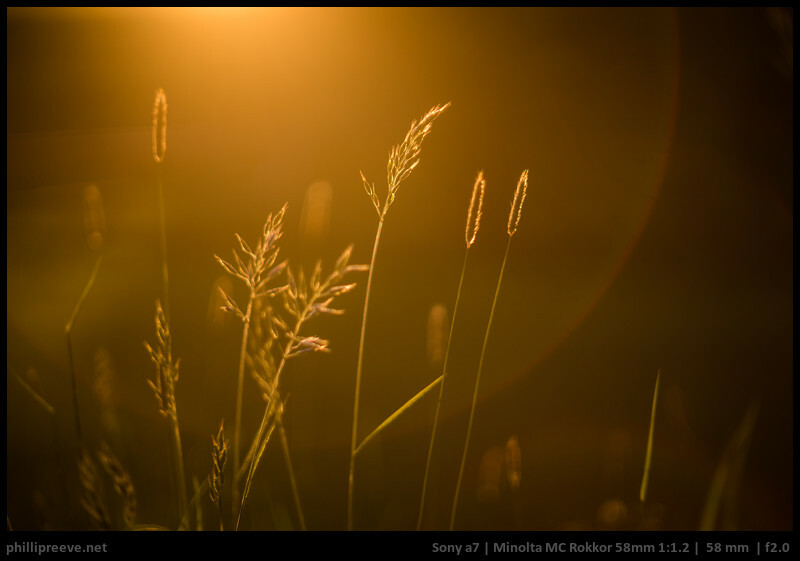 The 50 mc rokkor macro and 100 macros are outstanding-also the 85mm f2 version is awesome. Does autofocus work with this lens? Great review Phillip with some really nice images. This is one of the most exciting lenses I’ve used and the only thing that has a similar image rendering is the new Nikon 58 1.4g which costs much more and has a lesser build quality. 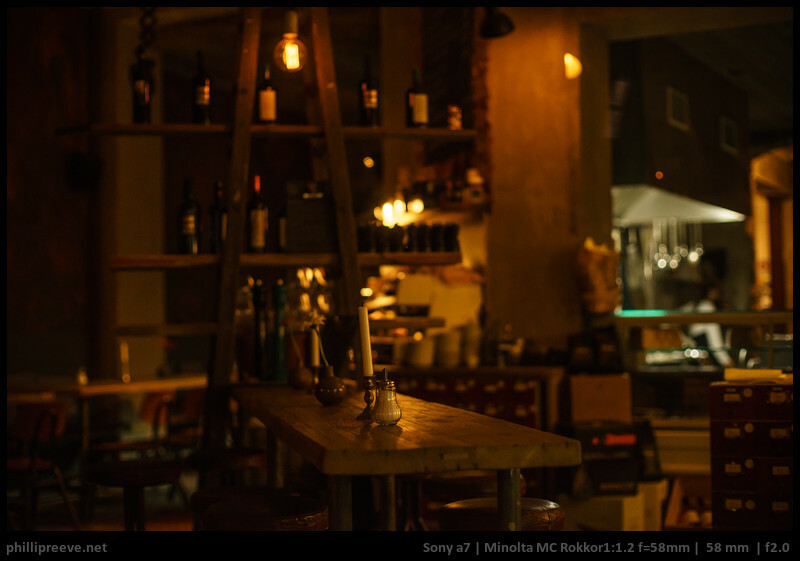 How do you find the Canon FD 58mm F1.2 to this Rokkor 58mm F1.2? thanks for all your nice informative work. I like to follow you all over the place (forums, flickr). Maybe I can contribute a little to the last question. I have a MD 1.2/58 and a FD 55/1.2 SSC. Both have beautiful bokeh, no question. Both are lenses to be used wide open. From my experience the Canon has much less contrast, but is much sharper, especially in the corners. I love to use them both. If you prefer less contrast and less saturated colors like in high key portraits, you might prefer the Canon. The others probably favour the Minolta lens. The Canon renders highlights close to the corners differently. The Minolta renders almond shaped highlights the Canon’s highlights look more like a 3/4 moon: round on the outside more flat on the inside. But May 2014 in this thread you wrote that you use this lens now? Lens seems really nice, how close can it focus? Nice review though I always struggle at buying fast lenses to use stopped down. I know why and I understand it, but my brain always catches on the idea. I recently picked up the Konica 57mm f1.4 and have fallen in love with it. I also use a Nikon 40mm f2.8 which is just crazy sharp. I love the rendering this lens gives, it’s often “painterly”, even stopped down, (which is a very subjective term I know). However, I got so fed up forgetting to rack back from ∞ , resulting in mirror hits with the 5DII, that I sought out something else with similar rendering. The Voigtlander 58/1.4 SLII I found to be very close. 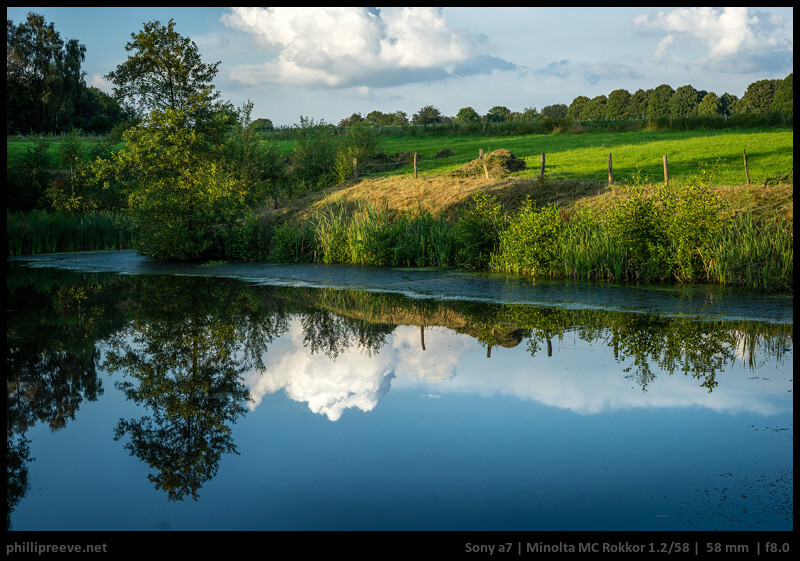 Now I use the A7 like you, I need to compare these two lenses directly. They are both beauties. 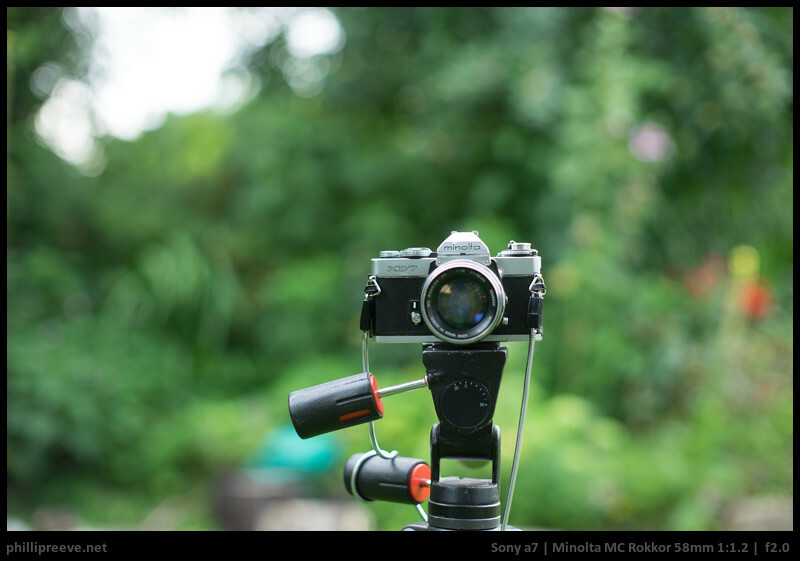 Likewise, I own the Minolta 58mm f1.2 and I also have been wondering how the Voigtlander 58mm Nokton compared. Have you had a chance to make that comparison? Nope and won’t get it anytime soon. I would expect better flare resistance and higher contrast from teh Voigtlander. No idea how bokeh compares. Somebody totally stole your photos to put in an eBay listing of this lens. Pretty sneaky. So if you’re shooting in F2 on this lens why wouldn’t you just get the cheaper F1.4 version and use that lens in F2. 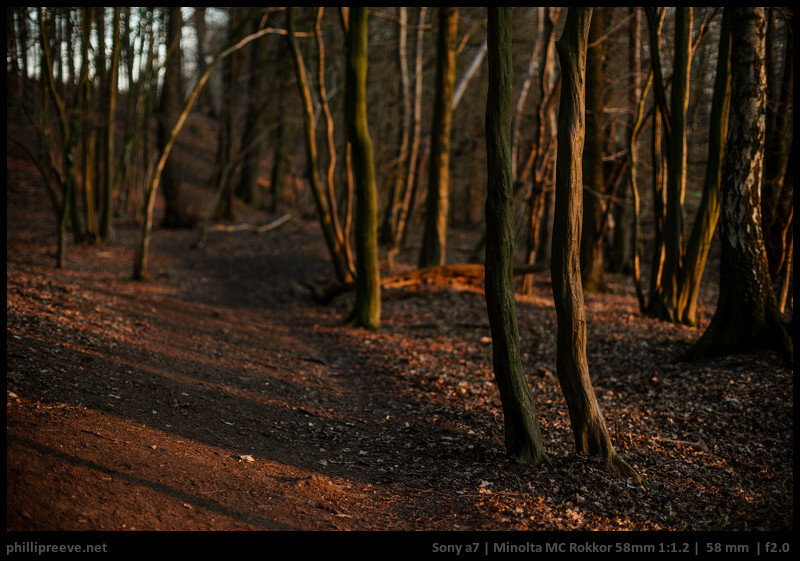 I didn’t say that I never use f/1.2 ;-). 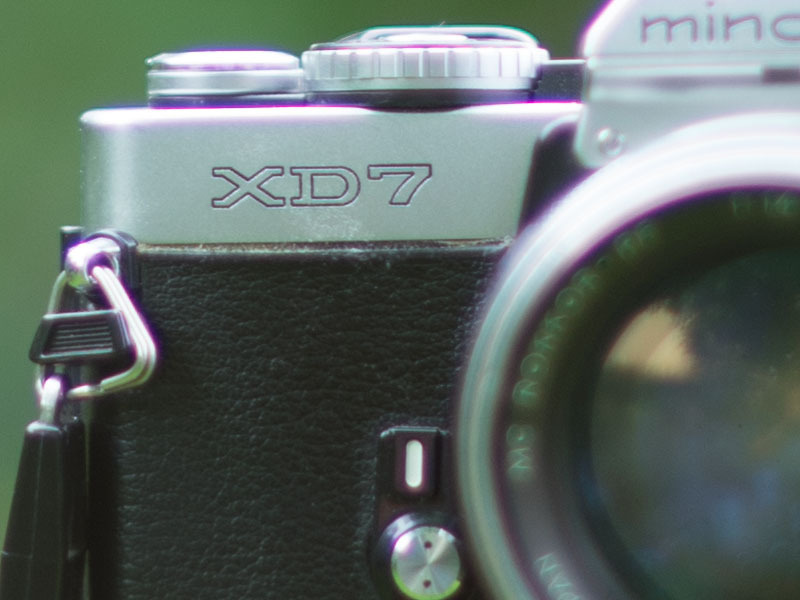 Also I think that the 1.2 is a better performer and it has 8 not just 6 aperture blades. I own a 1.4/58 maybe I will find the time to compare them a bit more carefully to be sure about my opinion. Thanks for this review with good image samples. 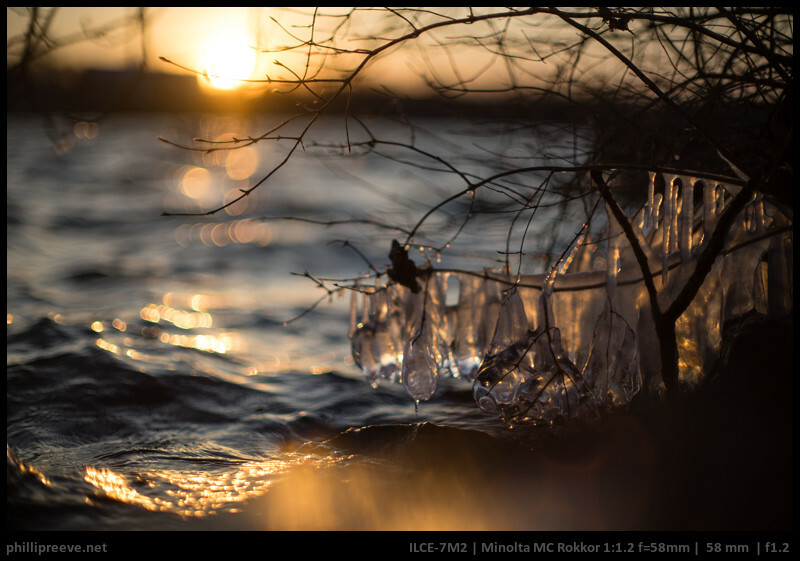 Since this lens is so much better at f2 than at f1.2, I just want to suggest another very good Minolta standard lens: the very cheap and infamous MD 50mm f2. 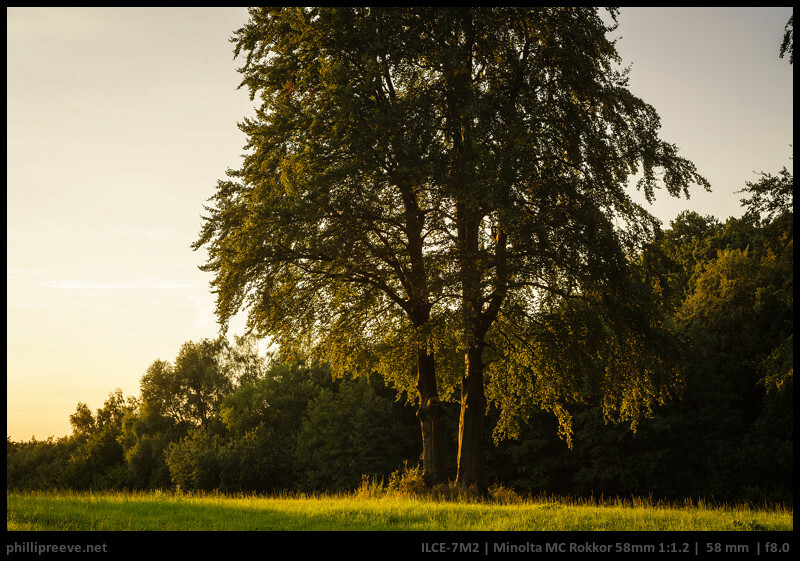 I didn’t compare it with the 58mm f1.2 personally, but it seems to beat all the other Minolta standard lenses at f2 and f2.8 concerning sharpness. It is fully usable wide open so in case one wants to save some money and weight, it is an excellent alternative. The used price is about 5% of what the 58mm sells for, can you imagine? I have reviewed that Minolta MD 2/50 and it is indeed the best Minolta normal lens when it comes to across the frame sharpness. But it doesn’t have the nice bokeh of the 1.2/58 nor is it build as well. 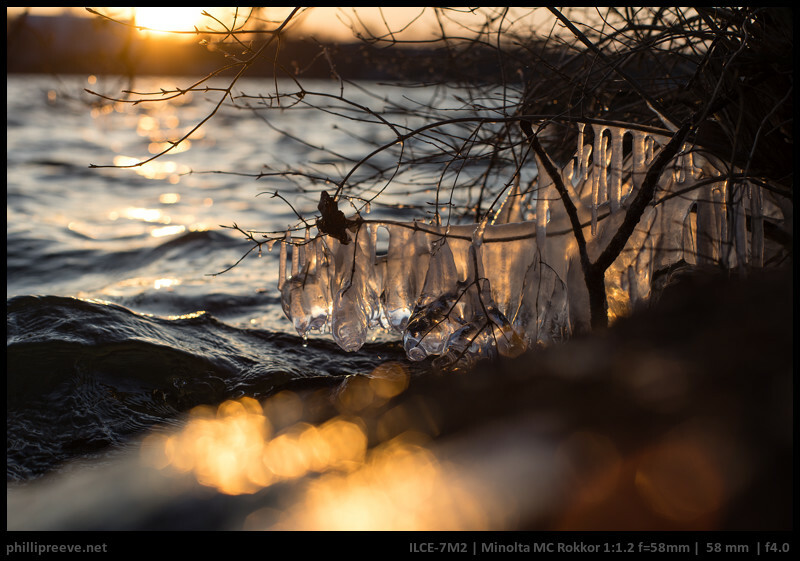 It was your test that made me use the MD 50mm f2…haha. Just forgot where I read about it, but there are more websites that mention the f2. I just think the 58mm isn’t worth around $ 450, paying that much doesn’t guarantee making better photos, but sure there is a difference in quality of bokeh and build quality. 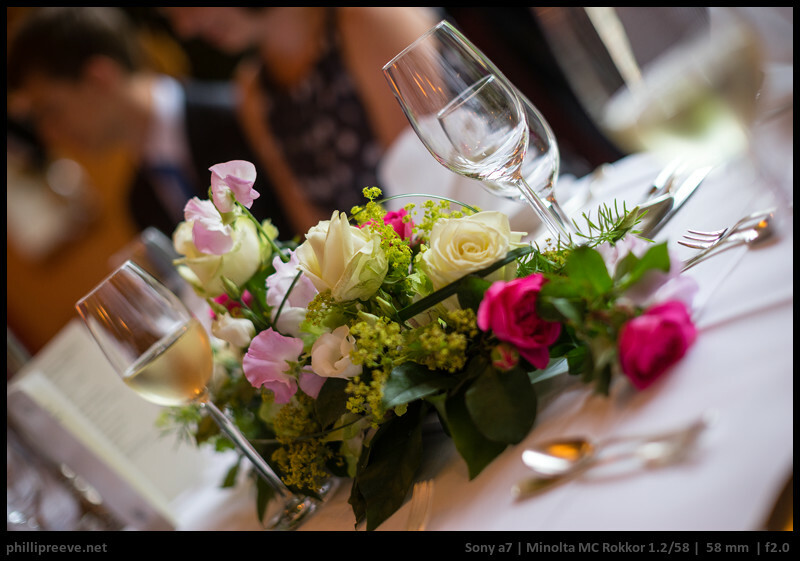 What I like about the 58mm -although not owning that lens- is that it seems usable and sharp enough at 1.2. Wonder if it makes sense to go for these beasts though on a digital body. 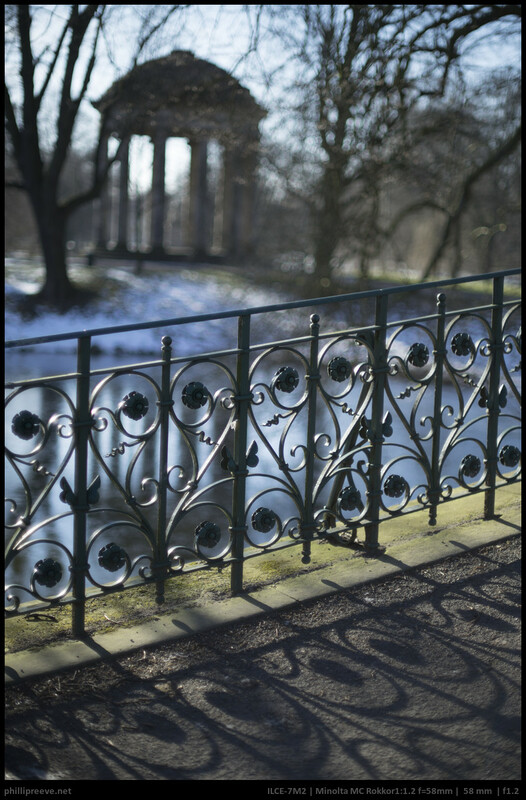 Film grain is not a problem anymore so anything that gives similar bokeh at f2 will do. Hi phillip!, I recently own one and came with full aperture always (aperture ring move but the blades don’t ) may be send it to clean or repair (do you have experience with similar problem?) 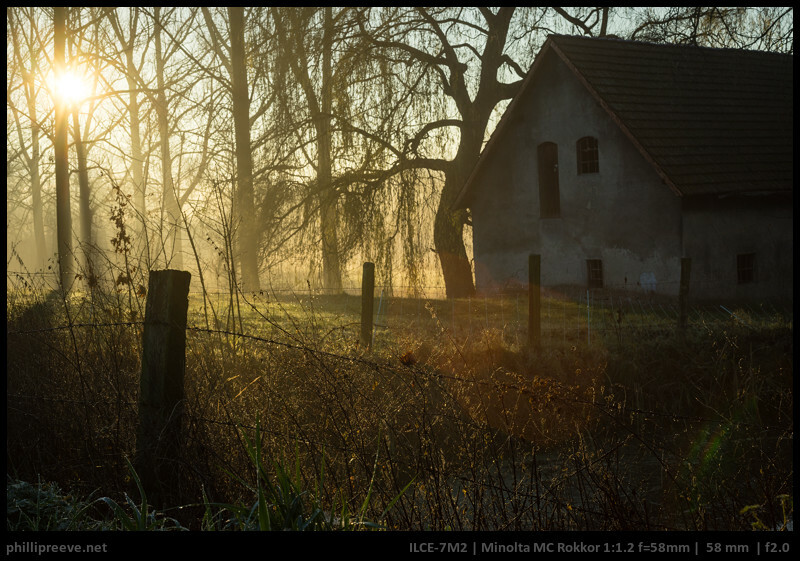 , meanwhile I use it and always 1.2 ,do you have a profile to use on Lightroom? Hi Phillip! Appreciate your review a lot. 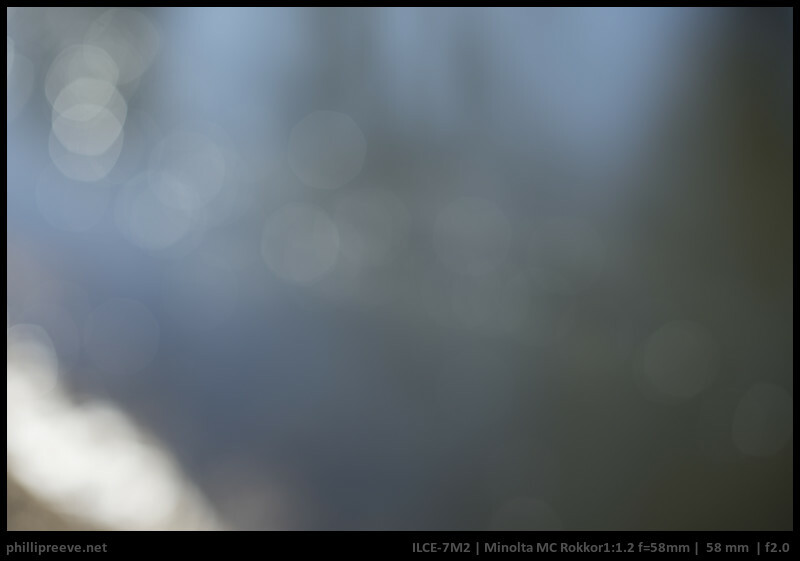 I just recently got a copy of this Minolta 58 mm f/1.2, and I noticed pretty severe spherical aberration wide open. As I try to focus, it achieves best contrast, but is out of focus, and when it is on focus, there is some haze-like thing. I also notice some focus shift. Just want to confirm, it is also the case for your copy? Thank you a lot. Thats in line with my observations. This was one of my first reviews and I wasn’t really experienced at doing them so some aspects aren’t covered. 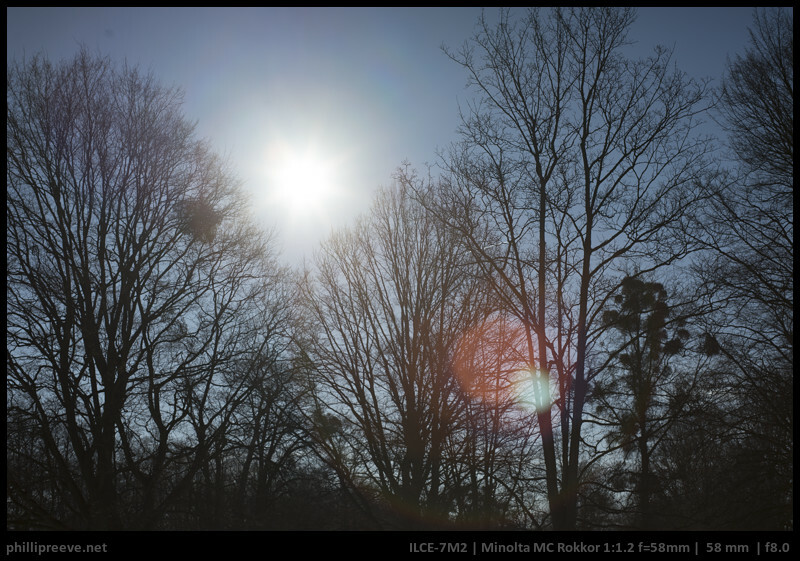 I have a 58mm f/1.2 in the MC Rokkor PG version. I just have learnt the good repute of this lens by your words. Maybe the photos you show are postproceed on sharpness ? The lens have a bit of play between its pieces, do you think the problem can come from that ? As I write: At f/1.2 it isn’t very sharp and my copy will produce halos as well. There should be no play. Hello and thank you for putting all the info together. Have been following your blogs and have finally bought the legacy lens blog. I recently purchased the 50mm 1.2 and am also looking at 58mm 1.2 just to play around. What I am keen to know is whether a7ii is better to use with these lens and adapters or a7rii? I am in the market for one and with the recent trade-in promo, both are within reach. Is there any damage to the camera by using these (I suspect not but just to be absolutely sure.) Appreciate your guidance. 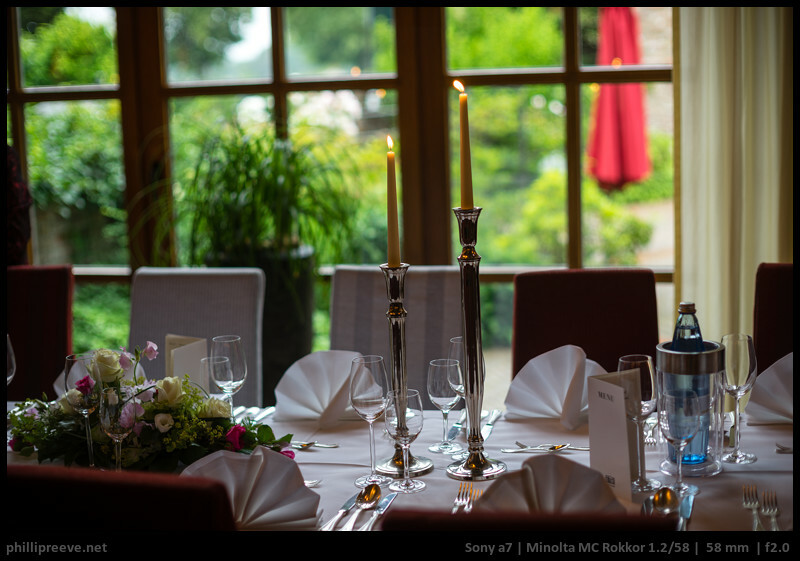 The camera doesn’t really matter, results with the a7rII wil bet at least as good as with the a7II often better. Hey, I was wondering if this lens was compatible with Minolta X300. I just discovered your website and I have to say I already love it. I’m using the 58mm MC Rokkor-PG 1.2 on an A6000. Shooting wide open I’m experiencing same banding issues as described here: http://admiringlight.com/blog/first-impressions-handevision-ibelux-40mm-f0-85/ . 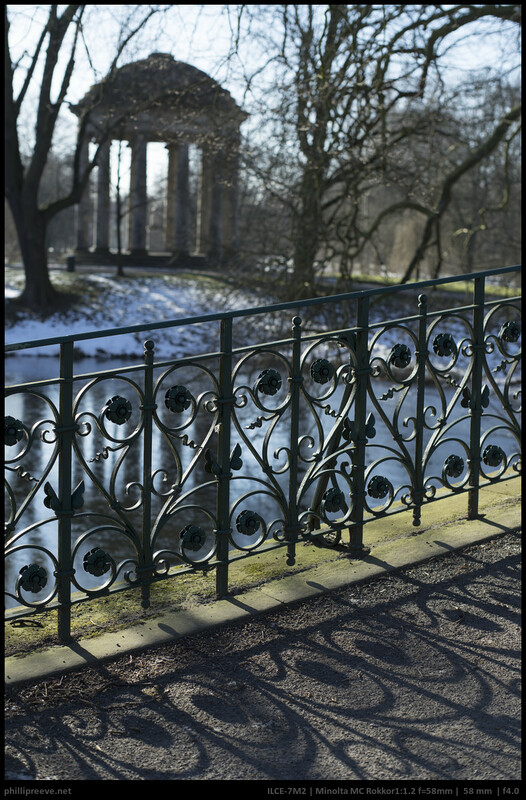 The same thing using the Super Multi Coated Takumar 50mm 1.4 with the Zhongyi lens turbo II @ 1.4. In both cases banding disappears when stepping down the lens. 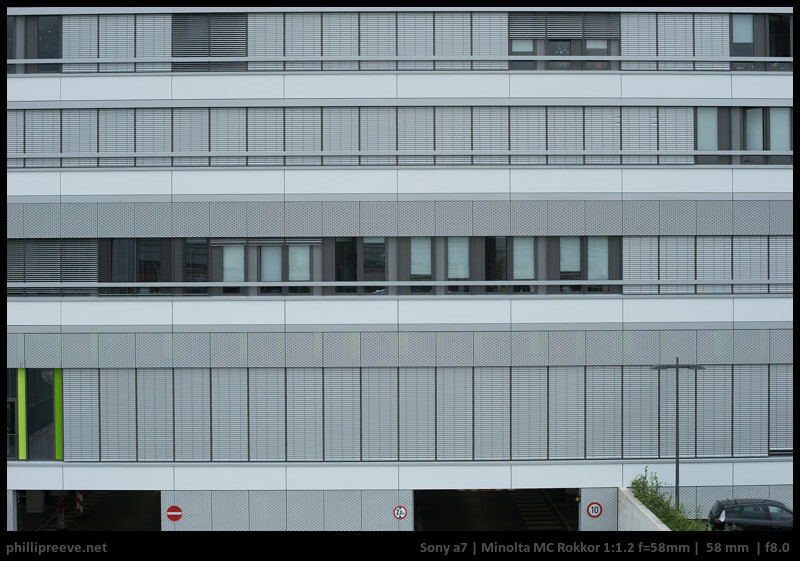 Have you experienced any banding on the A7 at super fast apertures? Do you know if the A6300 or A6500 have the same problem as the A6000? Hi Pablo, this is the first time I read about the banding and I have never experienced it with my a7 or a7ii. To appreciate it you must look at the image at 100%, it’s more obvious on unfocused areas. Using the Takumar 50mm 1.4 without the lens turbo there’s no banding. 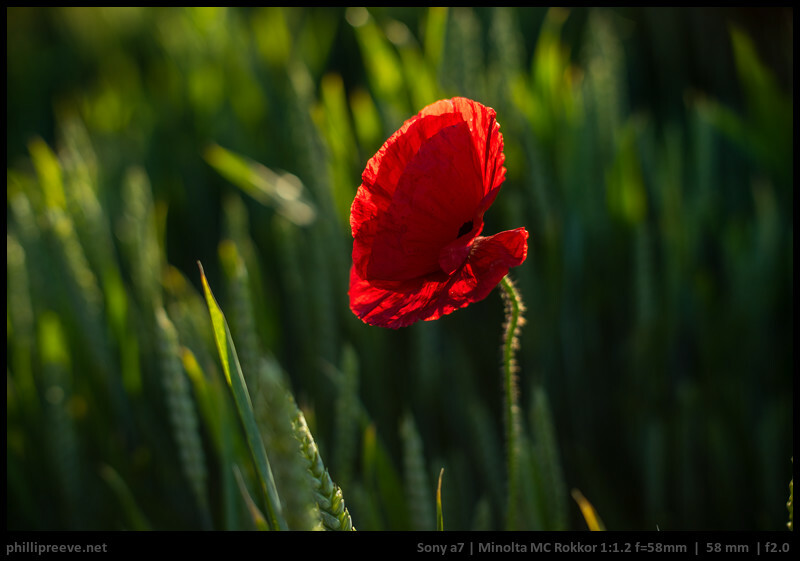 Only with apertures wider than 1.4. 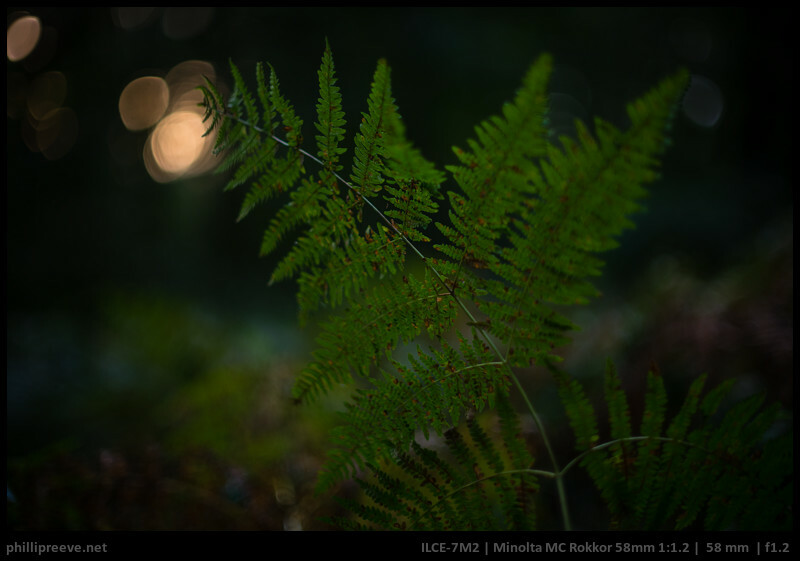 How does this lens perform at its minimum focus distance? Have you ever tried it on extension tubes? I bought one of these. It’s your fault. I love it, though. Great review! I purchased the Rokkor MC 55/1.7 based on your previous review and love it. I have the Mitakon 0.95 and the Canon FD 50/1.4 and Sony Zeiss 55/1.8. 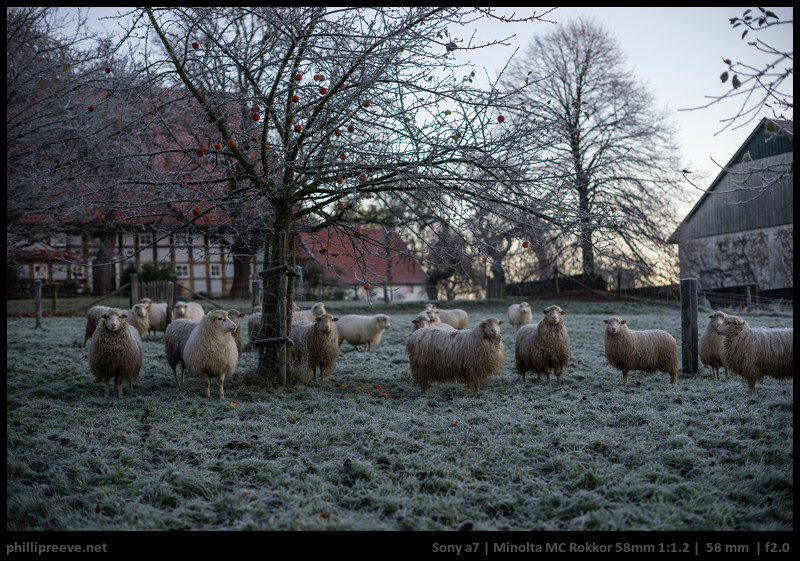 I just tested all 4 and viewing blind was shocked that we all preferred the rendering of the Minolta Rokkor 1.7. I can’t see any need for me for the Rokkor 1.2. Would love to see your comparison. They are all portraits of a friend and she is self conscious. She has asked me not to post them and I need to respect that. Maybe I could repeat the exercise with something non human. Snazzy review and I love those early morning pics. I had the 58mm 1.4 which was surprisingly sharp 2.8 and down. This one is a little pricey so never gave it a whirl. My favorite 50’ish was the 1.7 until I bought the 50mm 3.5 macro. Just seems to get used more. I’m putting a roll through my x-370 with the 40mm 2.8 right now which size and FL wise is a nice experience. 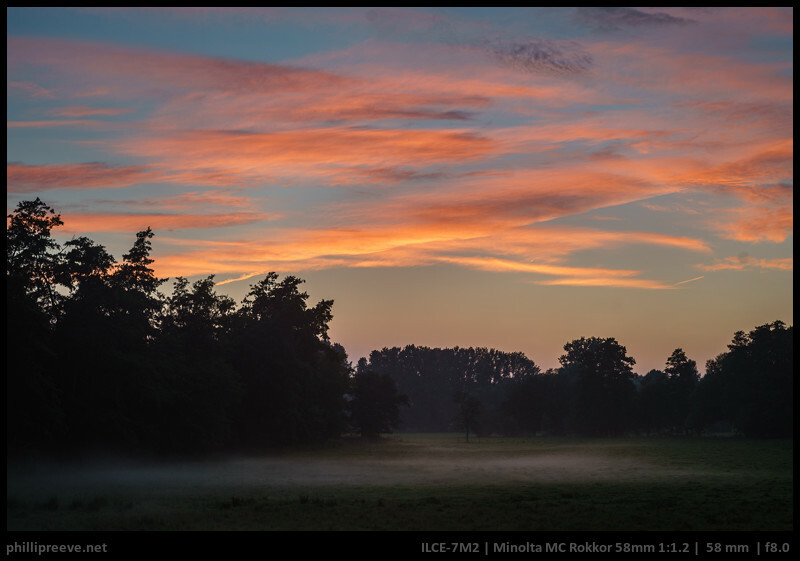 By the way, anyone interested….there’s a flickr stream called I love my Minolta 370, x-700 and x-500. Some great inspiration in there! I agree, it’s a nice review. Too pricey for me too and if that focus ring isn’t as smooth as specified in the ebay ad..they’re not that easy to fix, M Bernier tells. I used the 58/1,4 too, it is sharp a couple of stops down no doubt. My favorite lately has been the MD 50/2. Yes, horrible hexagons one stop down but it is actually sharp at f/2 and has perfectly fine bokeh then. It’s a nice experience on the XD7 which I love. Thanks a lot for the long term review. I love this old chaps , the way it looks and how it performs. Who care about the sharpest lens when this one offers you softness and sharpness regarding how wide it’s opened. I have it with me all the time with the MD35f1.8 along with a XE7 or my X570. I’m surprised that you are not mentioning the fact that these lenses are radioactive with Thorium dioxide diffused in the rear glass of the lens.. The rear glass(toward camera) emits a low level emission at or below 1 microseivert per hour, which is a low level, but radioactivity is cumulative, like mercury. With proper handling and storage, it can be managed, and it is not a large consideration, however you should make your readers aware of this risk/concern. Can you tell me something about your source and the exact version? I have been meaning to for ages but never actually did it. My impression of the 1.4/58 wasn’t that positive though. 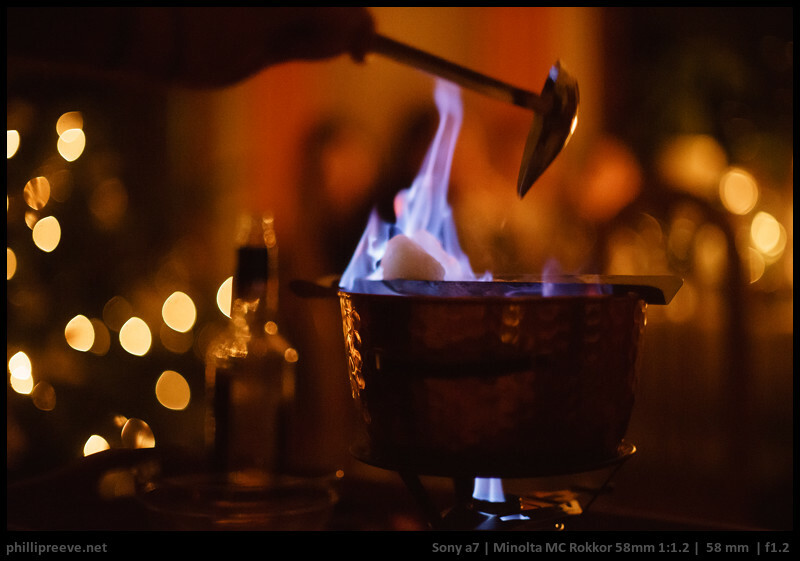 Review: 7Artisans 50mm f/1.1 – Fast, cheap but also good? 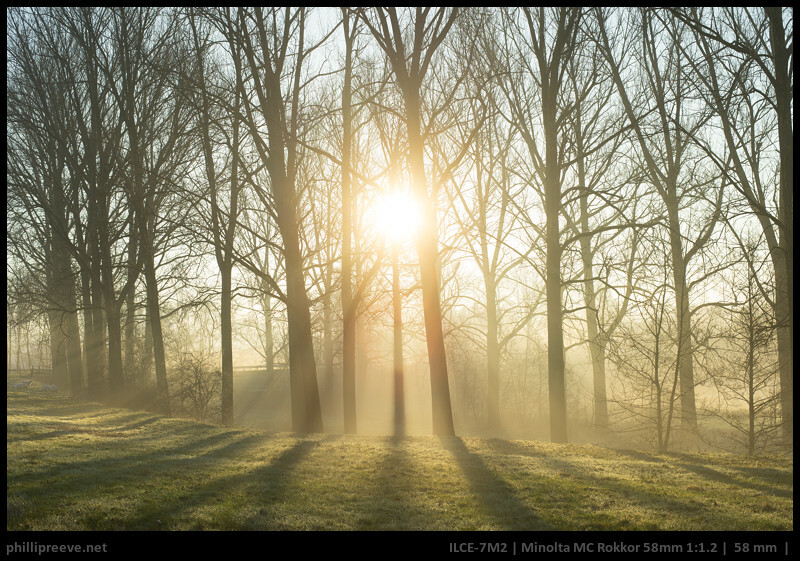 JuriaanM on Review: 7Artisans 50mm f/1.1 – Fast, cheap but also good? 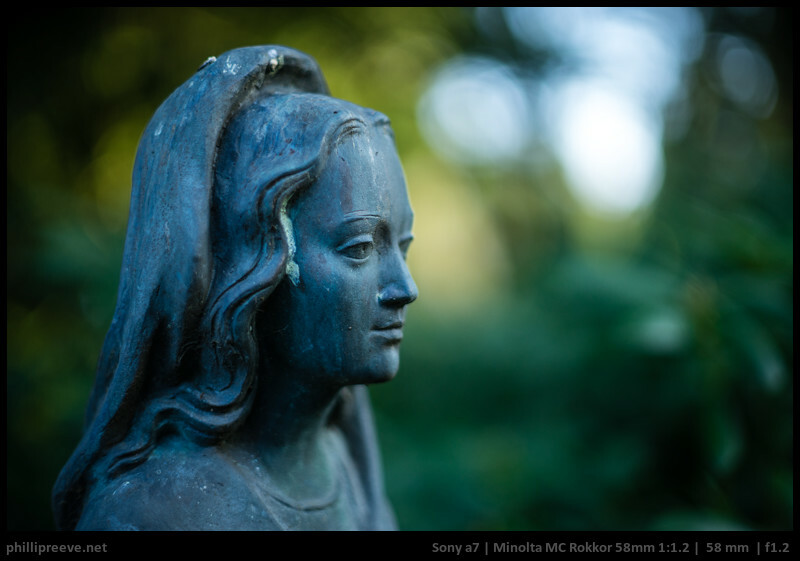 Adolfo Rozenfeld on Review: 7Artisans 50mm f/1.1 – Fast, cheap but also good?